Air Music Technology originally created Boom as part of the Creative Collection of instrument plug-ins included as part of Avid Pro Tools. As the popularity of Pro Tools grew, more and more musicians and producers relied on the incredible sonic firepower of this amazing Drum Machine. Boom continued to evolve, and demand grew. Boom is now available on its own by popular demand, available to anyone who demands instant creativity in AU/VST formats. Boom features a slick modern interface that pays homage to the most popular vintage drum machines of the past. Boom has been used on many famous projects since its launch, ranging from hit albums, feature films and radio projects. It’s one of the most loved Pro Tools Plugins. 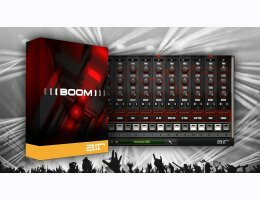 Boom includes a diverse collection of 10 different classic electronic drum kits, offering variations on the classic 808 and 909 kits, more aggressive Dance and Urban-style kits and a powerful retro style kit modelled on the concept of a 'CR78 merged with a 606'. Each one has been created with great attention to detail and provides serious sonic impact. Each kit contains 10 different drums, and you can adjust the panning, volume, tuning and decay of each drum within a kit. Each drum channel also contains a special tuning screw that can be turned to make a sonic adjustment, specific to a particular drum. This tweaking ability provides for nearly limitless possibilities with a user-friendly interface. You can mix and match drums from different kits to make your own custom kit, and the drum sounds can be triggered individually via standard MIDI pitch mappings. For instant inspiration, over 50 presets are included cover contemporary, classic electronic/urban musical genres. Boom also has an on-board sequencer that enables you to create and trigger your own patterns, which can be saved and recalled as presets. You can select different patterns using the keys along the bottom of the interface, when you're in Pattern Select mode, and these are conveniently colorcoded to show you how they map to a MIDI keyboard from middle 'C' upwards for remote selection. The Matrix display in the top left enables you to program a pattern, but if you prefer you can also use the keys along the bottom, this time with Pattern Edit mode selected. You'll find some nice touches, such as the ability to copy one pattern to another, and some simple controls for adjusting the way in which the pattern plays back within your host: normal, double, half or triplet time, and there's even a swing control mirroring classic MPC’s and other vintage drum machines/samplers. 10 different classic electronic drum kits. Classic 808 and 909 kits. Aggressive Dance and Urban-style kits. Powerful retro style kit modelled on the concept of a 'CR78 merged with a 606'. Each kit contains 10 different drums. Match drums from different kits to make your own custom kit, and the drum sounds can be triggered individually via standard MIDI pitch mappings. You may download a trial version of Boom directly from the Air Music website, at the highlighted link.